Keeps cuts and grazes protected from dust and dirt with our Children's Waterproof Plasters. Provided in an economical pack size of 100, these durable plasters have been designed as the ideal choice for small children who wish to continue playing after injuring themselves. Each plaster is individually wrapped for sterile application and has a latex free design so as not to cause any irritation. 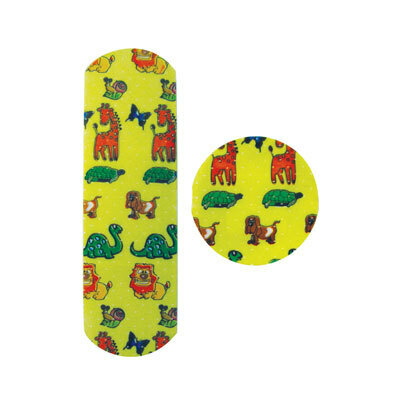 The plasters have been brightly coloured to keep the attention and excitement of smaller children and have a vibrant and playful animal print. Suitable for all manner of different shape and size abrasions, this assorted pack comes with everything from the traditional strip style through to round, blister-style plasters. Make sure your First Aid Kits is topped up for every different eventuality with everything from our First Aid & Medical Supplies category.